At Pure Romance, we take pride in the work we do and in our thousands of C onsultants who change lives, empower, educate and entertain women every day. 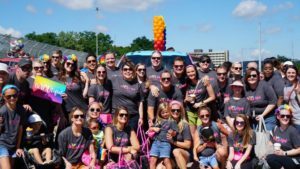 But on June 24th in our home town of Cincinnati, Ohio, we got to show off that pride during the Cincinnati Pride Parade and Festival, where more than 60 of our staffers showed their support and represented the Pure Romance Family. Pure Romance served as a Rainbow sponsor for the Cincinnati Pride Parade because we believe that every person should have access to sexual health information, be provided a safe environment to learn and explore their sexuality, and be accepted regardless of sexual orientation, gender identity or expression. 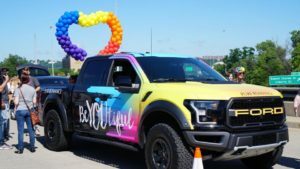 We had the chance to join hundreds of other marchers and thousands of spectators to celebrate individuality and what makes you beautiful (the t-shirts and sunglasses were big hits, as well!). Congratulations to everyone who took part in Cincinnati Pride. It was a beautiful day filled with love, pride, and unity. We are proud to stand with the LGBTQ community and celebrate diversity. You can see more from the day on the Pure Romance Facebook page!